I downloaded VCarve desktop to my windows 10 computer and also downloaded the clipart. The clipart goes into a users\public file that i can find. My problem is I can only find the VCarve set up file now and have set it up on my computer but cannot find the actual VCarve files that is suppose to have a Clipart Library browser. The Vectric instructions say to move the clipart files to the clipart library but I just cant find that in file explorer. Can anyone help? While there are many knowledgeable people on here, the best thing to do is go to the Vectric forum. That is what I do nd have always had my issue resolved. All the clip art from Vectric were in EXEs that self installed to the right place if Vcarve was installed. 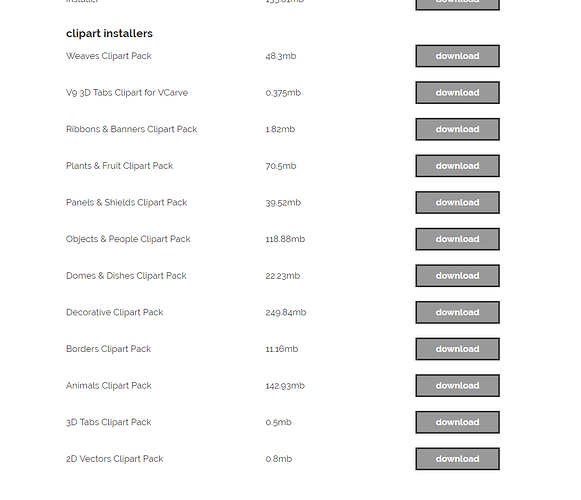 Hopefully all of you v9 customers will now have got your free update to the latest version (v9.5xx) which includes a nice enhancement for accessing the free clipart, as and when you need it. As Ron’s screen grab shows, some of the clipart packs are quite beefy downloads, which is why we don’t include them in the core product installer by default. The process described above is still available for those who want it (in case your product installation is not on a PC with internet access, for example) but for most of us, thumbnails of the free clipart collections are now shown immediately after installation but are actually downloaded only when they are first used (you can also right click and select download at anytime on an individual clipart piece, or for a whole category in the Library Folders section of the clipart tab). I hope that this makes the whole process a lot more intuitive right from the outset. PS. Full disclosure: I work at Vectric, in case that was not clear!